Tribes have started claiming title to New Zealand’s foreshore and seabed, which is the area between the high tide mark on the beach and the seabed out to 12 nautical miles from the shore, after a series of court rulings and two pieces of legislation over the past 17 years. From 1840 to 1997, this area, that covers over 100,000 square kilometers or 40 percent of New Zealand’s dry land area, had been considered as vested in the Crown under common law as it was in Britain. The argument over ownership of the foreshore and seabed started in the Marlborough Sounds in the 1990s when the Marlborough District Council declined to grant permits to farm mussels to Maori groups including seven tribes whose area covered the sounds. Those seven tribes made a joint application to the Maori Land Court in 1997 seeking a declaration as to whether the foreshore and seabed for the entire Marlborough Sounds was Maori customary land or a variant of it. The Maori Land Court determined that it could consider the issue, but was overruled by the High Court, and the case went to the Appeal Court. The Appeal Court ruled, on June 19, 2003, that the definition of land in Te Ture Whenua Maori Act 1993, which describes all land in New Zealand being either (a) Maori customary land (land not investigated by the Maori Land Court), or (b) Maori freehold land (land investigated by the Maori Land Court), or (c) general land owned by Maori, or (de) general land, or (e) Crown land, or (f) Crown land reserved for Maori, did not necessarily exclude the foreshore and seabed. The Appeal Court also ruled that the radical (fundamental) title to the area that was vested in the Crown was not inconsistent with native title, that various Acts had influence over but did not extinguish property rights, and that the Maori Land Court, a minor court that usually deals with inheritance disputes, had jurisdiction to determine an investigation of the title to the foreshore and seabed under section132 of Te Ture Whenua Maori Act 1993. The Court of Appeal decision overturned a line of precedent dating back to a decision in 1877 titled Wi Parata v Bishop of Wellington, and affirmed by the New Zealand Court of Appeal in 1963 in the Ninety Mile Beach 1963 decision. Moreover, once New Zealand came under British sovereignty in 1840. The ruling was made in light of the Crown’s interpretation of Article 2 of the Treaty of Waitangi to mean that for land to come into Crown ownership it had to be bought from some tribe even though much of New Zealand was not occupied or even visited by any Maori. Although all the Appeal Court said was that Maori could go to the Maori Land Court to claim title to foreshore and seabed, and might or might not be successful, this decision was often presented as a decision that Maori own the foreshore and seabed. The prospect of a successful claim created considerable hostility because New Zealand has a strong tradition of public access to beaches and waterways and this was perceived as being under threat. National Party leader Don Brash delivered a speech at Orewa on January 27, 2004, accusing the government of favouritism to Maori, both in the foreshore and seabed debate and in many other areas of government policy. Despite sharp criticism from Maori groups, Brash's speech met with widespread approval and an opinion poll put the National Party ahead of the Labour Party for the first time in over 18 months. The Labour/Progressive government passed the Foreshore and Seabed Act on November 18, 2004. The Act declared that the Crown. owned the foreshore and seabed and Maori can, however, apply for "guardianship" of certain areas. The Act was highly contentious. It split the Labour caucus with Tariana Turia quitting as junior Minister on April 30, 2004, to contest a by-election in her Te Tai Hauauru electorate on July 10, 2004. A protest rally of 15,000 people marched to Parliament on May 5, 2004. Turia was returned to Parliament as leader of the new Maori Party. South Island tribe Ngai Tahu got the United Nations Committee on the Elimination of Racial Discrimination to consider the legislation. The committee issued a report on March 12, 2005, stating that the foreshore and seabed legislation discriminates against Maori by extinguishing the possibility of establishing Maori customary title over the foreshore and seabed, and by not providing a means of redress. A further United Nations report by Special Rapporteur Professor Rodolfo Stavenhagen that was completed in March 2006, was highly critical of the Government in a number of areas, including the Foreshore and Seabed Act, which it recommended should be repealed or amended. Tariana Turia introduced a Private Member's Bill, in October 2006, aiming to repeal the Foreshore and Seabed Act to recreate the legal status before the Foreshore and Seabed Act was passed. The first foreshore and Seabed agreement was signed on October 31, 2008 between the Ngati Porou tribe on New Zealand's East Cape and the Crown. The deed protects customary rights of local iwi and retains wider public access to Ngati Porou coastal areas. A general election on November 8, 2008, brought a National Party-led government in coalition with the Maori Party. The new Prime Minister, John Key, the son of immigrants who had spent much of his career working overseas, functions as a pragmatist who appears to separate ethical concerns from day-to-day decision-making. The new Treaty Negotiations Minister, Christopher Finlayson, had spent 12 years as a legal advocate for South Island tribe Ngai Tahu. New Zealand’s Mixed Member Proportional representation electoral system created a political environment in which the Maori Party, which got 2.39 percent of the party vote in 2008, could enter into a confidence and supply agreement with the National Party and demand repeal of the Foreshore and Seabed Act 2004. Finlayson set up an “independent” panel of three devout treatyists, Eddie Durie, Richard Boast, and Hana O-Regan, in March 2009, to review the 2004 Act. After conducting separate consultations with Maori and non-Maori groups, with submission opportunities for non-Maori groups scarcely advertised, the panel claimed widespread support for repeal of the Act. A consultation document with carefully phrased questions to elicit a “yes” response was the next stage, announced on March 31, 2010, with 20 days to complete. Key said that if there was not wide support the current law would stay in place. On April 28, 2010, a petition organised by the New Zealand Centre for Political Research and signed by 5000 people asked for a three-month extension. This was refused. Eleven marae and eight public meetings were held in the two weeks after Easter. Marae meetings were over two hours while public meetings were one hour and poorly advertised. Iwi representatives attended public meetings but marae meetings excluded the public. Key and Finlayson announced the repeal of the Foreshore and Seabed Act, on June 14, 2010, and the introduction of a new bill so all tribes could claim ownership rights to the foreshore and seabed. It was described as a “non-ownership model”. Negotiations between claimants and the Crown could be in private with the Minister concerned. Obtaining access to the response to Finlayson’s consultation document was difficult. Finlayson’s Marine and Coastal Area (Takutai Moana) Bill was tabled in Parliament in September 2010. A request under the Official Information Act found, on October 28, 2010, that 77 percent of those who replied to the consulation document supported retaining the Foreshore and Seabed Act 2004, and only 21 percent supported repeal. Moreover, 91 percent opposed Finlayson’s approach to the issue. The Coastal Coalition, a group formed in May of 2010 began a billboard campaign with slogans like “Visit your beach before I (John Key) give it away” opposing the bill as it went through Parliament. The Iwi Leaders group argued that the bill did not go far enough to satisfy tribal expectations. The Maori affairs select committee heard submissions, 95 percent of which were opposed to the bill, and returned the bill to the House unchanged, causing an uproar among the non-National Party mebers of the committee. The replacement Marine and Coastal Area (Takutai Moana) Act, that passed on March 24, 2011, repeals the Foreshore and Seabed Act 2004 and restores any customary interest extinguished by that Act, affirms the marine and coastal area as incapable of ownership, protects public rights of access, navigation, and fishing, recognises and promotes the exercise of, the customary interests of iwi, hapu, and whanau in the common marine and coastal area, and provides for the responsible Minister, on behalf of the Crown, to enter into agreements with applicant groups for recognition of protected customary rights. To establish customary title a test is provided in the Act, whereby Maori applicant groups have to demonstrate exclusive use and occupation since 1840 without substantial interruption. 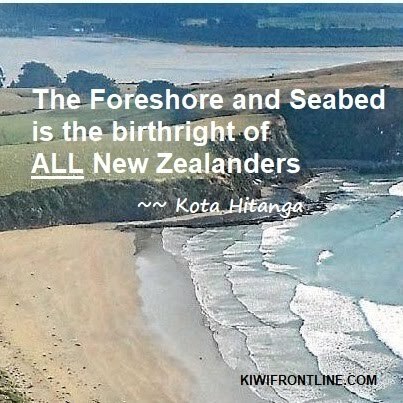 In other words, the Act takes the foreshore and seabed out of public ownership and gives tribes the right to claim it while making a big show of continuing public access..
By December 2012 there were 27 claims to the foreshore and seabed: Te Rarawa claimed from Hokianga to halfway up 90-mile Beach, Ngati Porou claimed East Cape, Marlborough tribes claimed all of Queen Charlotte Sound, Gore Bay, Tory Channel and the western side of Cook Strait, while other northern South Island tribes claimed the area from Kahurangi Point to Cape Farewell.